The "Optimal" curves are for the rear of an MR2 (roughly 750lb per corner) with 400lb springs, and were generated using the equations found here: http://www.optimumg.com/docs/Springs...Tech_Tip_4.pdf, with a damping ratio of .65 and a high/low split point of 3in/s. As you can see the compression damping lines up nearly perfectly for this spring rate, and rebound matches up reasonably well depending on adjustments. However, this begs the question, if the compression damping is "perfect" for 400lb springs, what about those running Konis on stock springs? Two things. One, in a "compromise" situation like with soft stock sprigns extra damping can, in a sense, be substituted for spring rate. It won't change the max roll angle achieved in a steady state situation, but it will make it take longer to achieve that roll angle, and so in transitions it will feel stiffer. Two, it isn't all that far off. With 210lb stock and a damping ratio of 1 (critically damped) instead of .65, it lines up pretty much perfectly. As with the Race inserts that I dynoed a couple of weeks ago, there is very little cross talk from the rebound adjuster into compression. A very slight amount at full rebound, but in their defense, I never actually tried the race shocks at full rebound. They may well have done the same. The first half turn of adjustment does very little, especially at low speeds, but beyond that the adjustments are useable. And very repeatable. I went back and re-tested a few of the settings and the data points were matching up pretty much exactly. One thought I have on these is that they seem to be lacking in low speed rebound damping, and until you get to pretty much full stiff they are quite linear in rebound, instead of the generally preferred digressive shape. However, these struts are about 6 years old, and have been through quite a lot over the years, so it is possible that they aren't a 100% accurate representation of a brand new shock. In terms of max spring rate, using this particular theory for "optimal" damping the rears should handle 500lb springs pretty well, but above that is really pushing it. Here's the comparison of the two rear struts at three different adjustment points. Very close at full soft and 1 turn, a bit further off at higher rebound. And one is a bit softer than the other on the bump side. Shock that I posted above is shock "#2" in this graph. To get these to match up to my optimal curve, the adjustment is about 1/4 turn different. The optimal curve is for the front (about 500lb per corner), with 300lb springs, and the same damping characteristics as the other graphs. My first thought on the fronts is that I like the shape of the rebound curve a little better than the rears. More low speed rebound, making it more digressive. However, I don't know nearly enough on the subject to speculate as to why Koni would have chosen to valve the rears like they did, assuming it was in fact a decision and not just "how they are". The adjustments are nice and consistent, and even full stiff is not ridiculous. Max spring rate on the rebound side appears to be about 400lb. Interestingly, the compression damping matches up with about an 800lb spring. Apparently Koni valves their Sport shocks with significantly more compression damping than the formulas I am using would suggest is appropriate. Unfortunately, I discovered that one of my fronts is non-functional and needs to be replaced, so I wasn't able to get a comparison for the fronts. However, once I get a replacement I will be able to dyno a brand new front strut, which should be a worthwhile data point on it's own. Last edited by Alex W; October 31st, 2018 at 09:13. Alex, thanks a ton for this info. This sort of validates what I've been feeling in my car that the rebound damping is too slow when fully open and it takes a couple of turns to actually get it under control. It's really disappointing (although not surprising) that there isn't anything to be done on the compression side as far as adjustments, and I think (at least on my car) that there is too much compression damping (specially high speed) and hence why the shock feels like it's all packed up. Now with this data in hand, what aftermarket lowering springs available for our cars would you say work best with this shock? Yeah, it's unfortunate but not really surprising that you have to spend quite a bit more money to get adjustable compression damping. As far as lowering springs go, I don't know of any that wouldn't be appropriate with these shocks, but if performance is your goal the stiffest ones you can get would likely be best. Then just use the damping data as a guide to setting the shocks to match the springs as best you can. There is one thing to note with regards to the "optimal" curves in either the graphs I have posted or generated from the calculator spreadsheets on my web site. Basically, I consider them to be an optimal starting point, but plus or minus a quarter turn or so from there could definitely be a useful tuning tool. That said, if you find yourself having to massively deviate from that it may be a sign of some other underlying issue that, while maybe you can compensate for with damping adjustments, doesn't mean that you should. the points of 1turn and 1.5turns make me think that a progressive spring rate would be best. Why is the "optimal" curve so linear with very little initial damping in the 0-1 and 0-2in/sec range? The Yellow looks like a typical Koni with very little initial compression damping. I wouldn't take this as the gospel on how to setup damping, but I think it's a good starting point. Given the limited adjustment available on even the best shocks, I think the exact shape of the optimal curve is pretty irrelevant. It's just to get your in the ball park. That said, if you have a link to another theory or set of equations, I would like to read it. "If I see further, it is only by standing on the shoulders of giants"
There are a few damper books out there, but many of them are a bit out of date. 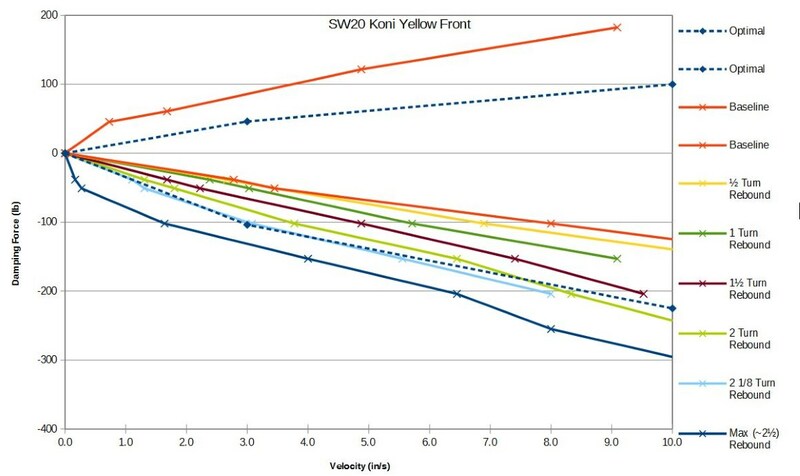 I was just speaking generically from the perspective of seeing a lot of racing damper plots (albeit with way more low speed damping than you would want for the street) but even looking at the KW V3 plot that you just recently performed, there is a lot less initial 'nose' in the damper curve (in the 1in/sec range) than even the V3. True, and I am sure you are right that it is due to them being a street oriented damper. 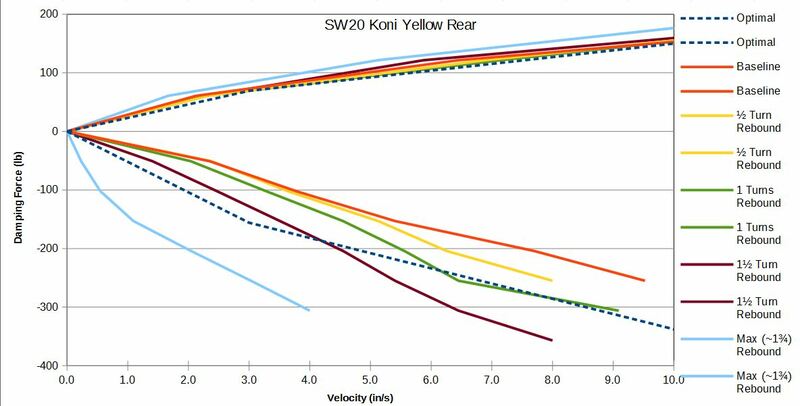 Take a look at my Koni DA Race dyno plots from a few weeks ago: https://www.mr2oc.com/showthread.php?t=570297 Much more noticeable nose, and a lot more damping in that 1in/s range. I also just realized that due to the nature of how my dyno works, it is very possible that a small low speed nose will not show up. Basically, I test at a variety of fixed forces by varying air pressure to the pneumatic cylinder. So the lowest force I test at is 30lb bump / 26lb rebound (10psi). Actually, on the Koni Yellows my first data point was a 20psi, so those forces are doubled. So my first data point on these graphs is all the way out at about 2.5"/s, and the graph is just drawing a straight line from there to zero. Having just realized that, I really ought to go back and re-test them at 10psi. I have already put them back on the car, and at the moment don't feel too much like taking it apart again, but I do have a spare front (same one that is graphed above) that I could test to get a low speed data point. I will do that tomorrow. So you determine force by timing the stroke of a known distance from a known input (psi)? Do you take various points and then connect the dots to form your graph? It seems like from this process you can't 'cycle' the damper for it to build heat and be measured 'at operating temperature' like a rotary dyno, nor can you measure the damper's hystersis. The small snapshot of this method seems very narrow in view for drawing conclusions other than the damping force created at ambient temperature for a single stroke... It also sounds like a very painstaking process and I commend you for it. Pretty much. And you are right, it really only provides info about the basic valving. It's not perfect, but I do think it provides useful information. I typically take data points at 20psi increments, plus one at 10psi. And I often do a couple of strokes at each pressure and average the results (usually, they are very very close). I'm not sure how much cycling would be required to build enough heat to be meaningful, but one could stand there for a few minutes at run the shock up at down at ~5"/s to warm it up if you wanted. The main thing however is that I was able to build my dyno for about 500 bucks (there are commercially available ones of a similar design for about 1500). From what I have seen rotary dyno's start at about 10x what I paid, and go way up from there. I'm sure they are better in every way, but not really reasonable for the average hobbyist to own. Last edited by Alex W; February 25th, 2015 at 08:39. What is the resolution of your 20psi increment tests? I know it depends on the valving and damper, but do you typically plot in 0.25in/sec segments, 0.5in/sec, 1.0in/sec, etc...? I would focus a lot of time in the 0-1, then 1-2, and 2-3in/sec range, then take bigger swings/spacing in the highspeed range. It would be interesting if you took a measurement on a cold damper, then cycled it until the shock body was 150*F and then re-take that same measurement. I have played around with doing more data points (10psi increments), but generally it doesn't improve the graph too much, other than that first one that I for some reason didn't do on these particular shocks. And of course it takes a lot more time. I figured out why I didn't do a 10psi test on these... At 10psi, the force generated isn't enough to overcome the gas pre-charge, so I can't actually do a compression stroke. And the rebound stroke comes back "faster" than the 20psi rebound stroke. However, 15psi does work, and I did update the graph with those data points, as well as showing the data points so you can see what points where tested and what points where interpolated. I also eliminated the duplicate compression curves, since they were all pretty much the same. What I meant by 'resolution' was, if you go up 10-20-30psi, does that get you from (say): 0.5in/sec to 0.75in/sec, or do you go from 1.0in/sec to 3in/sec and then you extrapolate and draw a straight line from 1 to 3 in/sec? I think it's crucial to get as many datapoints as possible in the 0-3in/sec range. On another note, for your testing, the results could vary quite a bit based on the 'can' pressure inside the damper, no? You can see the data points on the updated front plot above. On the compression side, 15psi gives me a data point at about 1"/s, and 20psi gives me one at about 2"/s. 40 and 60psi land at roughly 5 and 9 in/s, respectively. On rebound, it depends on the setting on the damper. At full soft, even at 15psi I don't get a data point until almost 3in/s. At full stiff, I have three data points in the 0-2"/s range. Yes, I imagine that the pressure would effect the results, more so at low speeds where the force produced by the gas pressure is much greater relative to the damping force. At higher damping forces, the contribution of the gas pressure would be much less significant. However, the Koni Yellows are the only shocks I have tested so-far with noticeable gas pressure. The Koni Race and the KW shocks are not pressurized (or at least, they do not spring back on their own when compressed). Alex, have you calculated the motion ratios and roll center heights of the car? I have, but it's been a long time. I am planning on re-measuring one of my cars and recalculating some of that stuff here in the near future, and making one concise listing of some of those numbers. Off hand, the motion ratios are on the order of .95, a bit lower in the front due to slightly more strut angle. Roll center heights, I cannot remember exactly at the moment, but you should be able to find by digging through my old suspension analysis threads (in the Automotive Engineering section of the forum). Something in the 5-6" range comes to mind, but I would have to dig to say for sure. Stock, the rear (roll center) is higher than the front by an inch or two.